When Durga Bist first got her period, she was forced to sleep alone in a small makeshift hut. Littered with hay, insects and dirt, the hut was dark, claustrophobic and extremely cramped. There were no windows, light or ventilation, exposing her to unbearably cold winters and hideously hot summers. Without a door, she was vulnerable to snakes, bears and dangerous men: “I couldn’t sleep at night out of fear,” she tells Dazed. Bist is just one of the many victims of ‘chhaupadi’ – a socioreligious practice stemming from Hinduism that affects 95 percent of girls and women in far and mid western regions of Nepal, despite the fact it’s been banned for over a decade. A menstruating girl is considered ‘impure’, and is banished to a poorly built hut or cow shed made from mud, grass and sticks. She becomes an ‘untouchable’ and is not allowed to go to school, bathe or worship. If she touches cows or consumes dairy or vegetables, the plants will wilt and the livestock will perish, so tradition says. If she stays in the kitchen or touches any male member of the family, she will “anger the Gods” Tulsi Tamrakar tells Dazed. As a young Nepalese woman and chhaupadi follower, Tamrakar believes that if she doesn’t sleep in the hut, bad luck will be bestowed upon the family, and their “hands will curl up and become deformed”. Just this week, an 18-year-old woman in the western Dailekh district of Nepal died after she was bitten by a snake in a menstruating hut. She survived for seven hours after the bite, but died after medical treatment was delayed, as Al Jazeera reports. Two women died last year in separate incidents, where one woman died of smoke inhalation inside a hut. These traditional, isolating and sometimes deadly practices are widespread across Nepal; however, they are facing widespread challenge with the help of NGOs and organisations such as Restless Development: a youth led movement that (in partnership with the UN Trust Fund) is trying to abolish chhaupadi and violence against women in regions of Nepal. When Bist became involved with Restless, she questioned her banishment to the chhaupadi hut. After learning about reproductive health and seeing chhaupadi as a form of gender based violence, she was inspired to rebel against the tradition. When her period came she told no one, and instead of relocating to the hut she remained within the house. For three months, Bist frequently served her father food and drink and noticed that nothing happened. She realised that “the practice (was) not based on logic” she tells Dazed. After revealing her secret, she persuaded her family to demolish their chhaupadi hut. With a determination to secure local women’s rights, Bist became a campaigner for Restless. She teaches other young girls from her district – Chaumala, Kailali – that menstruating is a natural and powerful part of a woman's life. She empties out the religious taboos that posits girls as “impure” and “sinful”, using her own experience to prove that the “Gods do not get angry”. 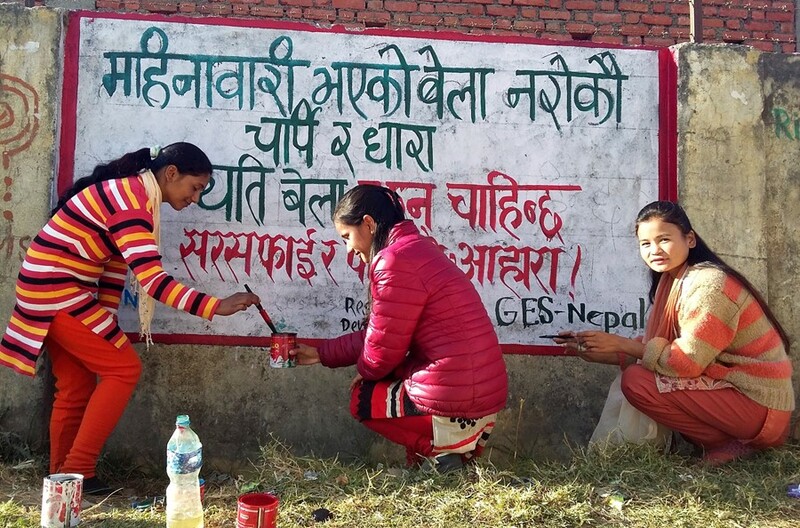 After hearing Bist’s account at a Restless class, Satya Nepali, a 15-year-old girl from her community, was inspired to challenge the patriarchal practice. With the help and support of Bist, she was able to convince her own family to reject the age-old tradition. Restless dismantles the fear that a menstruating girl is a source of contamination and will pollute the water supply. For some girls, the only sanitary equipment available is a recycled cloth; therefore, as they are forbidden to bathe properly, infection and disease is rife, and in some cases fatalities occur. Chanda Chaudhary, a leader at Restless, describes cases of “diarrhea, chest infection, pneumonia, suffocation and respiratory tract infections”. Infant and mortality rates are high, owing to the fact that mother and baby are banished to the hut immediately after birth. Restless ensures that women and girls learn of the importance of hygiene and nutrition during menstruation and pregnancy, giving them vital support, access to sanitary equipment and encouraging them to consume live-saving nutrients. Bist tells Dazed that a large part of their campaign is outlining “how insecure the huts are”, as the girls are victim to “drunk men who walk by” and dangerous wildlife. After a young girl was killed from a snake bite, Bist encouraged the community to see the dangers of chhaupadi. A few days later a terrified young girl called Manamati Budha told Bist that she had seen a snake in her own hut. After rallying a few girls together, the group confronted Budha’s family and convinced them to “demolish the hut right away.”. 17-year-old Nirmala Khadaka also persuaded her family to destroy their chhaupadi hut after discovering a scorpion among her bedding. As well as warning of the physical dangers, these women outline the psychological implications of chhaupadi. Sivanya BK, a 17-year-old from the Phulbari-Kailali district, says that chhaupadi prevents her from sleeping, and that she feels humiliated and frightened when “stay(ing) in the chhaupadi hut alone in the dark with open doors”. Research by the group reveals that chhaupadi has lasting effects on girls’ self-esteem, causing anxiety and depression. They aim to help humiliated girls such as Sivanya, encouraging them to see their periods as a source of power as opposed to shame. Despite chhaupadi being made illegal by the Supreme Court of Nepal in 2005, “there are no chhaupadi free zones in mid and far western Nepal”, states Chaudhary. As chhaupadi is bound up with religion and upheld by an older generation, it is a complex issue to tackle. Demolishing chhaupadi huts is only the first step, as change can only occur through reforming a collective and traditional mindset. Therefore, Bist specifically targets men, healers and the older generation to educate about the drastic effects chhaupadi has on adolescent girls. Bist states that “young girls are demanding change”; she sees “an energy in youth” and that the harmful practice will eventually be replaced by a “more open minded younger generation”. She soon hopes to declare her community “chhaupadi hut free”, as she encourages girls to be proud of their periods, to go to school and to challenge the social malpractice that constrains their autonomy.